What are the Stems, Isolated Track, Custom Backing Track and what is their difference from Karaoke? Stems and Isolated Tracks are musical compositions which are presented not in the form of one track (one file mp3 or wav), but in the form of several files, the number of which complies with the number of instruments performing a song. Isolated Track supposes that the sounding of the instruments doesn’t superimpose over the sounding of one instrument or section. Karaoke is a track where all instruments sound at the same time. Besides, you can’t turn off drums or guitar so that musicians could play their part alive. In Karaoke you may turn off an additional melody or (what is rarely seen) turn off the backing vocal. Having stems (multitrack-record) you may turn off any track at any moment or turn it off temporarily. To realize the advantages of stems, just download any multitrack and try to begin in any sound editing software! Why only a fragment of a song is played, where can I find a full version? Our player and mixer are intended only for preliminary audition and examination at the website, that’s why they play only a short fragment of a song (30 secs. as rule). 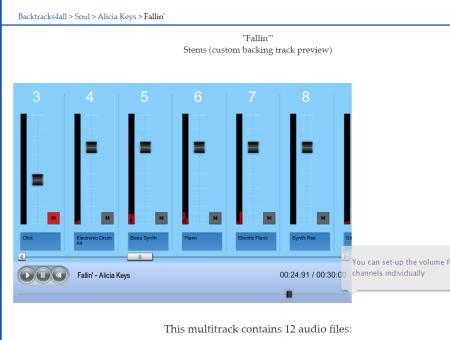 To get full tracks, use the links for loading, which are presented under the player on the page, where you can load a full mix quickly or each of them separately. Can I load a full song mix quickly? Yes. A full mix is available at the song page in the section containing downloadable links (mp3 format). These variants will be enough for you in the end of this list. 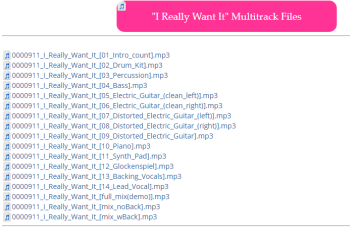 If you want to work at the song in detail, load links from the section ‘Multitrack Files’. Most of you are aware of mixer capabilities such as volume regulation or channel muting. We provide you with these standard capabilities, although our mixer doesn’t have panorama and equalization at the moment. We suppose that these capabilities you could easily find and use for loaded stems in widespread programs for editing and audio recording such as Cubase, Abobe Audition, Fruty Loops, Pro Tools. How to find a song at the website? 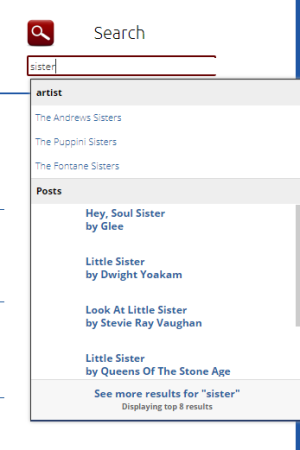 To find a song at the website, use the search form that is represented in overwhelming majority of site pages. The search on a song and singer name is available! How to mix available tracks? To create a mix from available tracks, make sure that you have loaded all instruments’ files, links for which are presented at the song page, and then add them to any audio editing software sustaining multichannel play and export. Something about how to change a song key or tempo? We strongly recommend you to transpose or stretch each track separately and BEFORE you create your final mix. Main reason: overall quality. Shifting key of tempo you ALWAYS loose quality because you add artifacts to transposed track. Audio-files with multiple sounding instruments has a complex spectrum structure and their pitch-calculation is not as clear and effective as single-file pitch calculation. More instruments = more artifacts. Here’s a very simple rule: calculate pitch separately for each track and then make full mix. In case if you want to change key of track you should try to find “Pitch Shift” function in your editor or read its reference manual. If you’re not a big specialist in audio-production software you can you use free online transposition services like this!